I am a carb addict, but I wanted to make a tomato sauce dish where the sauce was the focal point of the meal. I think I achieved that with this sauce. In fact, after eating this dish I don’t even know if the pasta is necessary. The roasted red peppers make this tomato sauce a little sweeter and a bit richer. I loved the sweet, rich tomato sauce paired with the bitter, crisp arugula. Turn on oven to broil. Roast whole red peppers until charred on all sides. Pull and steam. Heat olive oil in your favorite sauce pot. Add onions and garlic, cook until onions are translucent. 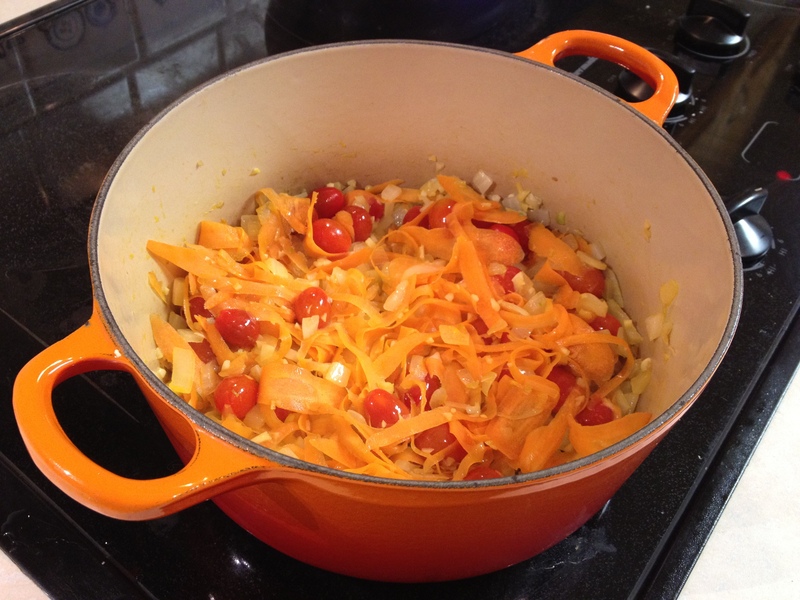 Add carrots and grape tomatoes. Cook for about 5 minutes. Add canned or fresh whole tomatoes and olives. Once the red peppers have steamed for about 15 minutes, peel and chop into about 1/2 inch cubes. Add to the sauce. Let the sauce come to a boil. Simmer for about an hour; the longer you let it simmer, the thicker it will be. Slice basil. Add it to the tomato sauce. Season sauce with salt and pepper. 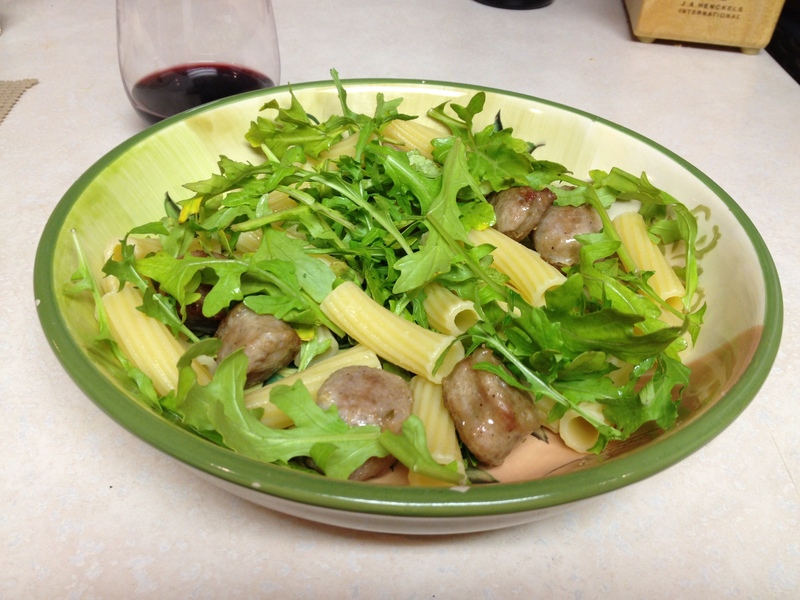 To serve, add pasta (if desired) to a bowl with 3 handfuls of arugula and sausage. Add sauce. 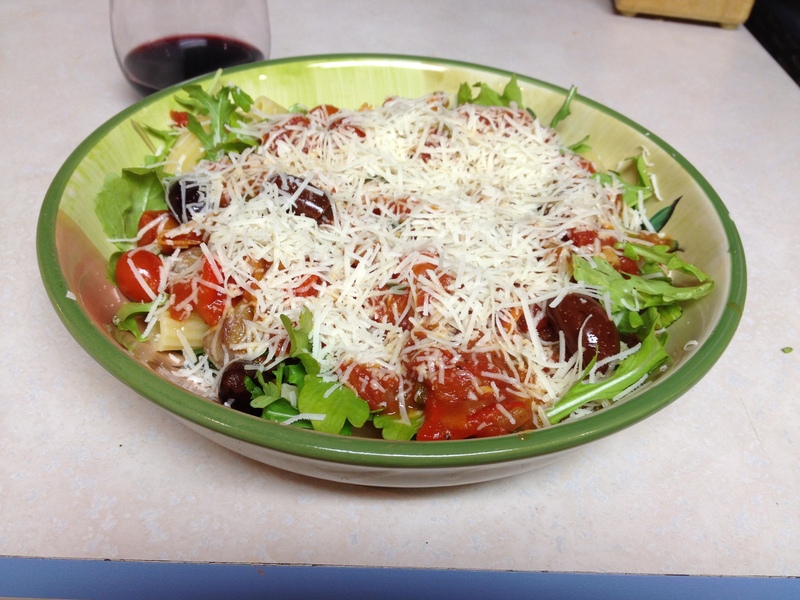 I topped my pasta with some Romano cheese, but I think Parmigiano cheese would also taste great. I chose the Romano because it has a stronger flavor to stand up to the sweet sauce and arugula.